The St. John's Wood Art Schools, founded in 1878, and situated in the heart of that artistic quarter, at 7, Elm Tree Road, N.w., have trained as many artists of repute as any art school in London. Byam Shaw, Lewis Baumer, Cadogan Cowper, A.r.a., Rex Vicat Cole, Campbell Tayler, Ralph Peacock, and John Da Costa are all old students, and many of them worked there during the principalships of the late A. A. Calderon and E. B. Ward, two of the finest teachers in London. The walls of the huge studios are enlivened with highly amusing mural decorations, bringing in many a portrait and sly caricature of students who have since risen to fame. In the portrayal of "Old King Cole," seated at supper amidst a goodly gathering of his merry men, one clearly detects the hand of Byam Shaw. For ten years Mr. Charles M. Q. Orchard-son, R.o.s., son of Sir W. Q. Orchardson, R.a., was principal of the school, and under the present regime there are four principals, Messrs. Frederick D. Walenn, Lewis Walker, A. Michaelson, R.b.a., and Pickering Walker, who also form the teaching staff. The fine old traditions of the school are carried on as before, and an excellent esprit de corps animates the students, who at present number about sixty women and girls and twenty men. Their latest exhibition of paintings and sketches completed during the year showed a high general standard of attainment. The honorary visitors to the schools are John H. F. Bacon, A.r.a., Walter Crane, R.w.s., Frank Craig, R.o.s., W. Hathe-rell, R.i., Sir James D. Linton, R.i., Charles Sims, A.r.a., G. A. Storey, A.r.a., Edward Stott, A.r.a., and William Strang, A.r.a. The principals, being closely in touch with many Royal Academicians, have a special knowledge of the requirements of the Royal Academy Schools, and are enabled to offer exceptional facilities to students desirous of entering them, with the result that no fewer than ten out of the eleven St. John's Wood Art Schools students who entered for the last examination in July passed in for probation. Of these two were admitted, and are working there now. In December, 1909, Miss Bentinck, a St. John's Wood Art School student, was awarded a highly coveted honour - the £40 prize for decoration at the Royal Academy Schools - and in December, 1910, another old student, Mr. Ralph Longstaff, won the same competition with a most poetical and exquisite composition, entitled " The Bathers," which was bought on the very opening day of the show. Another past student, Miss Claire Waters, took both the gold and silver medals at the show at Durban, South Africa. The traditional policy of the St. John's Wood Art Schools is to provide a knowledge of sound principles and technique, such as will equip students for the full development of their personality. Classes are held daily for drawing and painting from the life - both from the costume and the figure model - still life, minia ture painting, and painting from the antique and elementary work. Separate life classes are held for the girl students. A class for the training of observation and memory is held twice a week, conducted by Miss Elliott. Lectures on perspective are given by Mr. G. A. Storey, A.r.a., and two courses of hour. The students willingly pose for one another anatomy demonstrations are given during the year, one of which all students are expected to attend. A special class for black and white drawings for reproduction is held in the schools, and when qualified, students are given introductions to the leading journals and publishers. Mr. W. Hatherell, R.i., is the special critic, and, in addition to the prize given by the "Daily Graphic" in connection with this class, a three months' scholarship is offered by the principals. The weekly sketching class is an important feature of the school's routine. A subject is set, and a quick charcoal study is executed by each of the students and hung up for criticism by one of the principals, who, in awarding marks, lays the greatest stress on good composition. All four principals make a special point of individual attention, for, while the brilliant student needs only to be guided, others must be led, at any rate until they have gained a certain amount of definite knowledge, and with it confidence and self-reliance. The basis of all teaching at the St. John's Wood Art Schools lies in training the students to see in a broad, simple way, and in imbuing them with the art of selecting the salient features in the figure, object, or scene which they are about to depict. Mr. Walenn considers that the antique, if properly used, is invaluable. Still life is also an important branch of school study, the students incidentally studying drapery and the elements of composition by arranging their own still life studies under expert supervision. In contrast to these subjects of quiet study comes the memory class. Here the model poses for two minutes, and the students work from memory for ten minutes. At the end of that time the model is put up again for another two minutes, and the students again work from memory as before. Sometimes figures in action are substituted. A girl skipping, or a man working a saw, pose for a couple of minutes at a time in just the same way; the student seizes the position she wishes to record, and depicts it to the best of her ability. The schools are open all the year round. Students may enter at any time, and their term dates from the day of entrance. Working hours are from 9.30 to 4.30 on every week day except Saturday, which is a half-holiday. Every student is expected to become a member of the St. John's Wood Sketch Club, which enjoys the benefit of criticism from the honorary visitors. In addition to the prizes awarded by the club, a further prize is awarded monthly by the principals. The fine school buildings consist of several large, airy studios surrounding a paved courtyard, into which the girl students flock on sunshiny mornings to meet the beaming and delightful milkman who has visited the school at noon for the last twenty years. 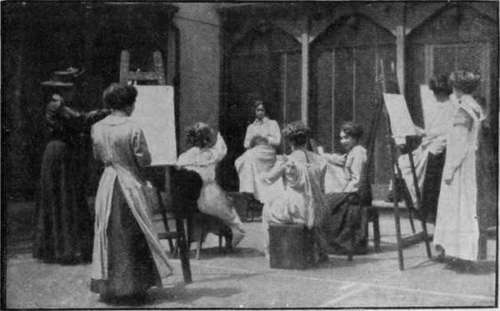 Sometimes, too, an impromptu sketching class takes place out in the courtyard during the luncheon hour, when one of the students will pose obligingly on a high stool while her friends sketch her. A silver and a bronze medal will be awarded for the best work from the life. A scholarship of six months will be awarded annually for the best set of three drawings from the life. A scholarship of three months for the best set of three drawings of a head from life. A scholarship of three months for the best still life group and a drawing from the antique. A scholarship of six months for the best work done in the summer sketching class. A scholarship of three months for the best work done in the Pinner landscape class. The Swaythling scholarship of six months (presented by Lord Swaythling) is awarded to the best work done by any private student, not a member of the school, under the age of seventeen years. The Montagu prizes are awarded for the best work done in the elementary, black-and-white, and observation classes. An out-of-door summer sketching class for the study of landscape painting is held in the picturesque neighbourhood of Pinner - only fifteen minutes by rail from town - by the principals on two afternoons a week during the summer term; and a special holiday class (which is not restricted to St. John's Wood Art School students) is held rather farther afield during the month of August and part of September. Last year the headquarters of the holiday class, under the direction of Mr. and Mrs. Leonard Walker, were at Pulborough, in Sussex, and the students had the special advantage of receiving a special visit from Mr. Stott, A.r.a., who came over from Amberley to criticise, and whose comments on the students' work were felt by students and principals alike to be most helpful. In criticising the studies, which were hung up for inspection in a neighbouring barn, Mr. Stott emphasised the necessity for feeling something definite about one's subject - its serenity or some other special characteristic- and then doing one's best to materialise that something in terms of pigment. As a remedy for the natural tendency of students to be too sketchy, he recommended the regular use of sketchbook and pencil in the careful delineation of tree forms, etc. Thus can be secured a number of studies of details of one's subject.